In the hot and desolate lands of Chile's Atacama Desert, seemingly lonely and lost, four huge metallic structures tower over the dusty summit of Cerro Paranal. Look closer, though, and you will detect a buzz of activity. The structures have names - Antu, Kueyen, Melipal and Yepun - and each encloses a telescope. Together they form the VLT, or Very Large Telescope, the world's biggest optical telescope facility. Every now and then, the VLT is in the news, when its astronomers make yet another discovery. 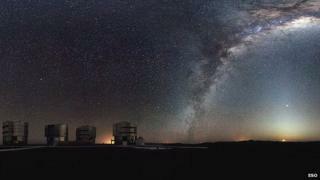 Run by the European Southern Observatory (Eso), the VLT became fully operational in 2000. Since then the telescope has tracked stars moving around the supermassive black hole at the centre of our galaxy, shown us the first-ever images of an exoplanet and captured the afterglow of the furthest known gamma-ray bursts. The Paranal Observatory offers perfect natural conditions for astronomers: there is virtually no light pollution; the skies are clear; clouds appear on only about 30 days a year. Still, observations would not be the same without the cutting-edge technology of the VLT. The telescopes are packed with instruments, both above and below ground. They allow scientists to capture images of stars and nebulas billions of light years away with the clarity you would expect of a snap of your cat snoozing on your living-room sofa. As the intensely red sun above Northern Chile disappears beyond the horizon, the domes of the four silvery towers slowly open. They gradually expose the telescopes, ready to eye the night sky and send astronomers valuable data about the Universe. "Look at this mirror," says Stephane Guisard, an optical engineer at Paranal, pointing at a piece of glass eight metres in diameter. One of the VLT's units is slowly rotating just above our heads. "The type of mirror we have in this telescope is not the same type of mirror you have in your bathroom. "The difference is its optical quality, its smoothness. For example, if it was the diameter of the Earth, it would be so smooth that the biggest mountain would be only a few millimetres high." This mirror is the main feature of each VLT unit. It is where the light from objects in the night sky first arrives. But there is no eyepiece for astronomers to peer into to get the final image. "Once the telescope points at the star we want to observe, the light [from this star] first reflects off the main mirror, which then concentrates it towards the secondary mirror, and then sends it to one of the three instruments of the telescope," says Mr Guisard. The astronomers will use different instruments for different tasks, depending on what they are looking for. Every time an observation takes place, the telescope rotates around both its vertical and horizontal axes. This rotation means spinning around a colossal mass of metal: the total weight of the moving part of the telescope is 450 tonnes. The main mirror alone weighs 20 tonnes - as much as four pick-up trucks. Because the rotating structure is so heavy, the telescope distorts - but it is vital for the astronomers to keep the shape of the mirror intact. "The eight-metre mirror is very thin compared to its diameter. It's optically very floppy. For example, if we were to put it on three points, it would break under its own weight," says Mr Guisard. "So in order for this not to happen and to keep a perfect shape while the telescope is moving, the mirror is supported by 160 actuators." This mechanism of continually adjusting the mirror is called active optics. But there is another system that helps astronomers get the best image possible - adaptive optics. Once a ground-based telescope points at a star, it encounters the turbulence of the atmosphere. This turbulence creates the twinkling effect in stars, which makes images blurry. To correct the distortion, astronomers use a bright reference star located close to the object being observed and measure the blurring. An adjustable mirror then compensates for it. "Without the adaptive optics, a telescope like one of the VLT units has a no better resolution than a 20cm telescope," explains Frederic Gonte, head of instrumentation at Paranal. "With the adaptive optics, it is better than the Hubble telescope in space." Adaptive optics has limitations, though. At times, a bright star is simply nowhere to be found. If that happens, another instrument comes into play - the Laser Guide Star (LGS). Scientists are able to make use of a laser beam so powerful that, once out of the telescope's dome, it pierces the atmosphere. "The LGS has been developed to compensate for the limitations of the adaptive optics," says Mr Gonte. "The laser illuminates the sodium layer of the atmosphere, 90km above the Earth, creating an artificial star that we are able to catch with our adaptive optics system and correct for the distortions in the atmosphere." Active and adaptive optics allow astronomers to fully exploit the capacities of such a huge mirror. The larger the mirror, the better the zoom - and the finer the details a telescope is able to discern. But there is another technique that makes the VLT the biggest ground-based optical telescope on Earth - interferometry. Just as you might zoom in on a colourful butterfly on a flower, an interferometer allows researchers at Paranal to get really close to distant stars and planets - by combining the four separate telescopes into one. This process transforms the VLT into a device with a virtual mirror 130m in diameter, improving the zooming capabilities almost twentyfold. To understand how the link-up works, a VLTI (VLT Interferometer) specialist, astronomer Jean-Philippe Berger, invites us to take a peek underground. The mountain underneath the platform is criss-crossed with tunnels, where researchers work in clean lab conditions. Mr Berger explains that it is here that the light from an object being observed with separate telescopes arrives after having been reflected off individual mirrors. As the telescopes stand 10s of metres apart, and because the Earth rotates around its axis, the light reaches each telescope at different times. "To compensate for this delay, four "delay lines" - small carts, moving on rails along the tunnels - use mirrors to continuously adjust the length of the light path and combine the light into a single beam," says Mr Berger. This way, the final image astronomers get is what would have been produced by one telescope with a gigantic mirror and a much better zoom. Katia Moskvitch was on secondment to ESO for two months leading up to her trip to Chile.